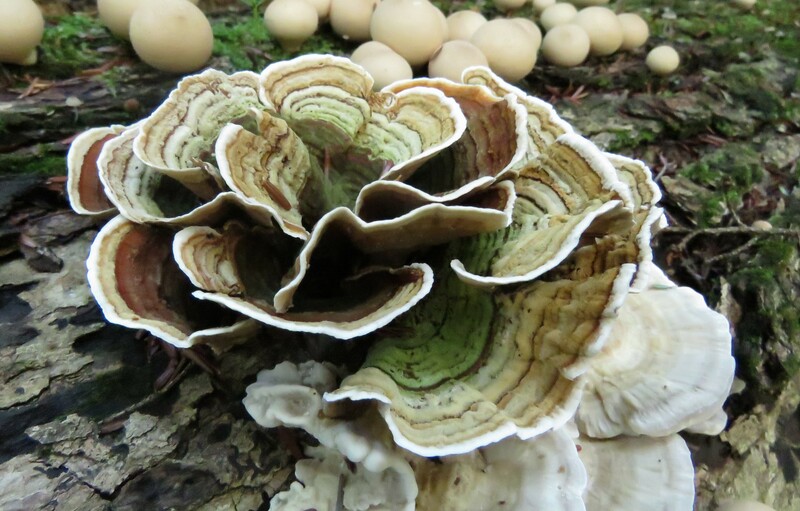 Turkey Tail mushrooms (Trametes versicolor) are fantastic forest fungi that are easily located in the dead of winter and in the sultry heat of summer. As forest foliage thickens during the early days of summer, these extremely common mushrooms may be eclipsed momentarily by the shadows created by dappled sunlight. If you want to photograph them, simply bring along a nature-inquisitive child on a trailside turkey tail hunting foray. It won’t take long until the excited cry of, “I see one!” is followed by an outpouring of enthusiasm to explore nature’s way at the dawn of summer. On sultry summer days the beautiful wooded swamps and protected wetlands of Cranberry Lake Park occasionally transform into short term havens for blood-thirsty mosquitoes and squadrons of dive-bombing deer flies. That is nature’s way all across the Wilder Side of Oakland County. I still remember a hot and humid late summer day when I meandered into that Oakland Township Park on a hunt for a few blackberries. I raced back to my vehicle a few minutes later with my arms flailing after becoming an involuntarily blood donor for what felt like millions of mosquitoes. Hawk Woods – Not Just For The Birds! The distant din of traffic from M-24 and I-75 was barely audible when I heard a rather odd sound. It seemed to come from a small pond nestled away on the west side of Bald Mountain Road in Auburn Hills. It sounded something like a hoarse frog struggling to sing an unknown melody. I knew it wasn’t a spring peeper, wood frog, or chorus frog, the three species most likely to have been singing in the last weeks of April. I tried to peer through a thick wall of invasive phragmites for a better view of the hidden songster, but had no luck. As I advanced off trail, my steps made a crunching noise on dried sticks. Then, in a burst of speed and flurry of wings the “frog” and his companion erupted into flight. That’s how my unforgettable and most delightful early morning exploration of the 80-acre Hawk Woods Nature Center began.